The Swiss don't normally make movies. This is a cold gray one, but it has a central theme that's human. It casts a light on despicable scams on older people, robbed of money. 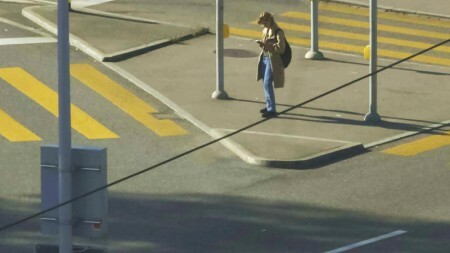 Two central sequences, all set in Zurich, focus on a young woman employed at a call center selling insurance or Internet service by day who uses her phone skills in her own time to bilk old ladies, claiming to be their granddaughter in desperate need of quick cash. Then she comes to collect it in a park pretending to be the relative's friend acting in her stead. The first time she succeeds. The second she has been tracked by police working with the old lady, and they take her away. But in between is a lot of dry footage of security guards, and such, and a man acting as the gatekeeper to a bank, the other to an insurance company. And the call center, of course, and all this talk we hear is boring and borderline nonsensical. That's the point, I guess: to hint, partly, at the sheer alienation of modern life, but also at how many of the everyday details of money and identity and corporate gatekeeping are wearying numerical garbage everybody has to negotiate. The spirit of Michael Haneke hovers over this short feature, but it hasn't the resonance or depth of characterization of his work; though its chilly style is accomplished and unified, it seems more like a needlessly, if skillfully, expanded short. Which it may be. The 34-year-old Schäublin, his bio says, studied Mandarin and Film at the Beijing Central Drama Academy, which sounds pretty brave, and then attended the German Film and Television Academy Berlin (DFFB). 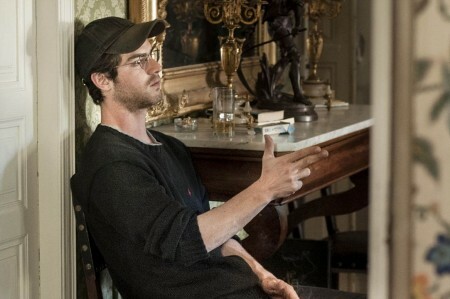 Last year he and Silvan Hillmann founded the production company Seeland Filmproduktion GmbH. This first feature is an accomplished and promising one, if it seems somewhat in search of a unified shape. In Swiss German dialect. Jessica Kiang in her Variety review calls this a "clinically intelligent, laceratingly pessimistic feature debut." Those Who Are Fine/Dene wos guet geit, 71 mins., debuted at Locarno Aug. 2017, receiving Special Mention from the Jury. Screened for this review as part of the MoMA-Film Society of Lincoln Center 2018 New Directors/New Film series. Last edited by Chris Knipp; 03-21-2018 at 05:36 PM. Portuguese documentary filmmaker Pedro Pinho's three-hour feature - with musical numbers toward the end - might be the most interesting failure of the year. Though it's won festival prizes, regular audiences won't have the patience for it, nor should they, because it's an experiment that's overong, its handling of issues of capitalism and collective factory ownership still left nebulous even after endless discussion. But the topics get a chance to breathe, and then some, and given their complexity and importance, that's a good thing. Ultimately how this movie was made and why are more significant than the unwieldy result. You could build a film course around it: you'd just need to make clear to your students that this isn't an example of a good film, just one that's fruitful to study and compare with cinephile favorites like Ken Loach and Miguel Gomez, Loach being germane for the worker-centric social realism, Gomez for the documentary-fiction element and focus on Portugal's economic crisis. And this reps a rare example of a neorealist musical - at the end, that is, mixture of genres being another useful subject for film study. Pinho bases his story (the title drawn from the play De Nietsfabriek by Dutch writer Judith Herzberg) on the Fateleva (Otis) elevator factory in Portugal, which was actually taken over by the workers and run collectively from 1975 to 2016. He uses actual workers, rather than professional actors. But in his version, the worker takeover begins in the present time. The owners try to seize the assets, and the workers block them. They have no union, as such, but they have solidarity, and a creepy Human Resources lady sent in to try to lure key workers into a buyout of individual jobs fails. Then, the question is how to proceed. They get a lawyer, to deal with the cops. Many heated and lengthy discussions follow. Much of the film is occupied with debates among the workers, and others, about how to proceed. There is - troublingly, Peter Bradshaw of the Guardian feels, and I'd agree it jars - the occasional self-reflective onscreen appearance of a film director as a character, telling the non-actors how to go, do it again, make it simpler and more basic this time, things like that. There is a lengthy debate of capitalism and marxist theory re factory takeovers mostly in French, why, we're not told; but that discussion is like plunging into a searching economics seminar that takes as its scope the whole future of human endeavor. It's thought-provoking in a way that a neater scene with tighter dialogue could not be, and it's a key example of how this movie is fascinating and instructive while still unmistakably a dramatic failure. Most of the actors, though vivid individuals, whose feelings we are given time to feel, don't get depicted in depth. The exception is Ze (José Smith Vargas), his adopted son, nicknamed Mowgli, and his girlfriend Daniele (Daniele Incalcaterra), who's Brazilian. Them we follow home. And they, especially when Mowgli is involved, truly come to life. But one might compare this to Laurent Cantet's 1999 film Human Resources, about a factory strike in France, in which there's a wrenching, incredibly dramatic and human and specific conflict that develops between a working class father and his educated son who's just joined management staff. Pinho is too wound up in the improvised general debates to think of developing the ideological and practical conflicts in terms of individual personalities. Here is a proposal: the natural perceived length of a movie is an hour and a half to two hours. If you make one that's longer, a sense of protracted time will be produced in the viewers. In this case, the three-hour length and the series of long drawn-out discussions among the workers has the effect of making the action seem real-time. But that effect becomes unwieldy, because you can't convey the series of steps required for a worker takeover of a factory in lengthy real-time segments. Hence Pinho's Nothing Factory, though absorbing for long stretches, ultimately gets bogged down and goes nowhere - except into song. The Nothing Factory/A Fábrica de Nada, 177 mins., debuted at Cannes MAY 2017 and won the FIPRESCI Prize; at about 20 other festivals including Munich, Toronto, Vienna, and Busan. Screened as part of MoMA and the Film Society of Lincoln Center's New Directors/New Films series for 2018. Last edited by Chris Knipp; 03-21-2018 at 10:20 PM. 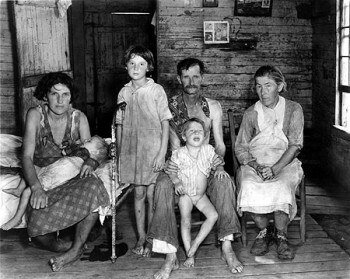 RaMell Ross has made a revealing and intimate short documentary feature about people he lived with and observed in Hale County, Alabama, where Walker Evans and James Agee made their book about white dust bowl poverty at the end of the Thirties, Let Us Now Praise Famous Men. This is a vastly different world, first of all because those Ross observes in his film are African American and well fed. He came to teach photography and coach basketball, a title tells us. He observed with his video camera for five years. He identifies half a dozen people, teens or young adults. They work in a catfish factory, raise a family, play basketball or football, learn to walk, die of infant sudden death syndrome, worship and sing, go to college. There is a world here, and Ross' camera is nimble, his editing rapid and surprising. Is this a "new cinematic language" as Bilge Eberi wrote in the Voice? I don't think so. It's just a new personality, a new camera eye. Certainly the intimacy, the confidence acquired, impress us, and the kinetic and frenetic events, such as Daniel, a young college basketball player practicing his outside shot over and over with the camera so tight up on him we see only arms and shoulders. Also memorable and troubling, a tiny girl walking back and forth for minutes rapidly in a small room like a caged animal, or a hyperactive child. A remarkable sustained shot with the camera still shows a whole basketball team in uniform in a staging area moving, working off each other, flopping around, their long young bodies partly like one body, yet each an individual. As with many new films presented as documentaries, this one poses the problem of limits. Ross tells both too little and too much. His "fractured" editing, as Eberi calls it, despite identifying of some people, blocks narrative expectations, echoes a contemporary world of short attention spans and constant interruptions. It finally made sense to me as the work of a still photographer turning to the motion picture. While often the motion is the point, observed with fascination, it is also beside the point. Because if you freeze the frames, the connected subjects, without narrative logic, make pictures at an exhibition by a keen observer who loves and knows his subjects. His editing follows shock logic or poetic logic. But he does not chronicle and inform us as a documentary filmmaker does, closely following lives, providing extensive details. As intimate as Hale County This Morning is, it tells only so much, and the larger story of these lives and their place in the fraught world of African Americans today is left untold. Hale County This Morning, This Evening, 76 mins., debuted at Sundance Jan. 2018. It was screened for this review as part of the MoMA-Film Society of Lincoln Center 2018 New Directors/New Films, where it was the New York Premiere and Closing Night film. Last edited by Chris Knipp; 09-20-2018 at 12:50 PM. Last edited by Chris Knipp; 03-23-2018 at 07:40 PM. A meditative, and rather repetitive, but nonetheless haunting, depiction of a childhood in the Philippines in the lae Eighties dominated by what now seem quaint technologies, especially audio cassette tapes played on an aging boom box - it needs to be cured of its habit of "eating" the tapes; and VCR tapes. This is a film that celebrates the way old means of reproduction can evoke lost memories from the times when they were used. This film is a strong evocation of Shireen Seno's childhood in the Filipino diaspora focused on Yael, an eight-year-old, primarily when she is at home by herself after school and in a few family gatherings. 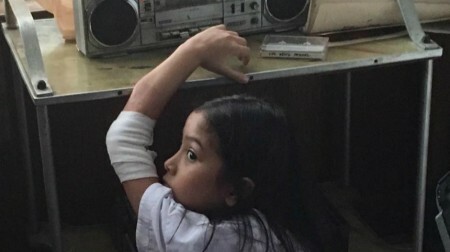 This is partly a secret world, as Yael (Jana Agoncillo) plays tapes that were sent to her mother, Val, by her father from a Persian Gulf country where he is working. When a tape gets broken, Yael repeats her father's words, which by now she has memorized. But Yael gets in trouble for accidentally erasing precisely the "private" part of a tape made for Val. She secretly plays and replays these tapes. And at other times she pursues "happiness" as touted by a TV advertisement. All this constitutes evocation of loneliness and longing of a child for her overseas Filipino employee father, missing during her childhood. At other moments, in sequences worthy of the artist Laurie Simmons, Yael enters the world of a doll house, an immersive, meditative one, and works in the dollhouse kitchen. Perhaps the most memorable scenes are ones in which Yael painstakingly cooks toy meals in tiny pots and pans over a toy stove, using real, painstakingly chopped food,the stove fueled by a small candle; she pours the resulting, tasty traditional dishes into tiny doll containers. They take so much effort, but would provide only a mouthful even for a child. The mood is one of patience and loving care. The meals are prepared in response to her father's longing expressed on the tapes for traditional Filipino food. This is a labor to preserve memories of memories of memories. In another sequence of touching childish longing Yael goes to a shop looking for an advertised pen labeled a pen whose tagline is "for a beautiful human life" as if that can remedy her longing and resentment. Seno sticks close to the childhood world, offering only fleeting clues of the late-Eighties turmoil in Marcos' Philippines or from the late-eighties outside world, hinting at societal turmoil following Ferdinand Marcos's ouster and complicated adult relations, in which men loom large and mysteriously. This depiction is faithful to its childhood point of view, so much so that it seem sometimes stunted, and above all repetitious and confused. But the vision here is distinctive, certainly. Nervous Translation, 90 mins., opened in the Philippines Nov. 2017. It showed at Rotterdam Jan. 2018 and later at Groningen. Screened for this review as part of the MoMA-Film Society of Lincoln Center 2018 edition of the New Directors/New Films series. Last edited by Chris Knipp; 03-23-2018 at 07:50 PM. Filmmaker-artist Helena Wittmann’s subtly audacious first feature follows friends Theresa, a German, and Josefina, an Argentinian, as they spend a weekend together on the North Sea, taking long walks on the beach and stopping at snack stands. Eventually they separate— Josefina eventually returns to her family in Argentina and Theresa crosses the Atlantic for the Caribbean—and the film gives way to a transfixing and delicate meditation on the poetics of space. Self-consciously evoking the work of Michael Snow and masterfully lensed by Wittmann herself, Drift is by turns cosmic and intimate. Last edited by Chris Knipp; 03-18-2018 at 09:11 PM. Thierry de Peretti's debut, Les Apaches (R-V 2014)was a movie about an act of group vandalism that goes very wrong, an incident on Corsica where young outsiders clash with rich property owners. The filmmaker tackles a more ambitious subject the second time around and it's less of a success. The topic is a group of men who carry out large scale vandalism in the name of Corsican independence - from France, from the mafia, and the trajectory of a young man from a good family who enters this world. The resulting melange of gangsterism and political idealism is one less familiar in a modern day story like this than in the Seventies. Here, the the scruffy and slightly remote protagonist Stephane (Jean Michelangeli), is a kind of GQ revolutionary, a good-looking young bourgeois whose Corsican origins lead him to carrying out crimes at first only to please cousins and without any caring. These get him two years in prison, and the prison is like a spartan school in nationalist politics, after which Stéphane is not just a member of a gang but ideologically committed. But all that is in flashback. The present moment is the funeral of a childhood friend and gang member that Stéphane comes back for despite having a target on his back. De Peretti has his own way of working, as was evidenced in his debut feature, Apaches. It doesn't work as well this time, because the mixture of revolutionary and gangsterish themes here - this somewhat limp and meandering movie - can't evokes genre expectations the filmmaker isn't capable of satisfying as do directors like Uli Edel in The Baader Meinhof Complex or Marco Bellocchio in Good Morning, Night/Buongiorno notte or Olivier Marchal in the 2011 A Gang Story/Les Lyonnais (Rendez-Vous 2011). And De Peretti makes his story unreel in a too-complicated manner that keeps momentum from building and confuses the viewer and diffuses the effect. Sme Anglophone critics have felt this as I did, that De Peretti's film lacks strength of organization and drive. But it did well enough with home (French) reviewers. For example Thomas Sotinel of Le Monde Wrote (as quoted in AlloCiné) that "Thierry de Peretti creates out of political and criminal violence in Corsica a remarkable intimate tragedy." A Violent Life/Une vie violente, 107 mins., debuted at Cannes May 2017, releasing theatrically in France 9 Aug. 2017 (AlloCiné press rating a strong 3.7). Also shown at Caborg and Reykjavik. It was screened for this review as part of the MomA-FSLC 2018 New Directors/New Films series. A Distrib Films release. Last edited by Chris Knipp; 02-24-2019 at 01:38 PM.